Our first Queries + Answers was posted on 7th February 2013. Here are the Q+A 25 to 32 with subsequently posted Indhhk Group articles below which are relevant to the subject but may not answer the original query. If you can help add information about any of the queries I would be delighted to hear from you. Hugh Farmer indhhk at gmail dot com or just leave a comment beneath any article. Q+A 25 To Kwa Wan Foundry – WW2 BAAG report. Elizabeth Ride has sent this British Army Aid Group (BAAG) group report. Any information about this foundry would be very helpful. The report suggests it was part of or close to a shipbuilder/repairer through its casting parts of marine engines. Q+A 26 Tsing Shan Mine (Castle Peak area)? – Japanese occupation, WW2 This British Army Aid Group report of 1944, mentions a “rumour” of a mine on or near Castle Peak. Tsing Shan is the name of the well-known monastery located at the eastern foot of the mountain. There was an initial flurry of interest, seen below, in Green Spot when the Q+A was first posted but little has been added since then. Lawrence Tsui: I remember a soft drink production company in the early 50s in the To Kwa Wan area where one could watch the production line from the street through a huge window. I think it was the Green Spot factory. It was quite an entertainment for a small kid. York Lo adds: Here is what I gathered from multiple sources – Green Spot was founded in California in 1934, by the late 1930s it was already bottled in Shanghai, (the licensee was Lau Bong, who was also involved in Camelpaint). 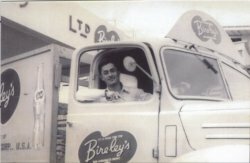 In HK – Vitasoy obtained the rights to bottle it in 1950 as the article you cited implied but by 1958 the rights were passed on to Amoy Canning. It is unclear why/how Vitasoy gave up on Green Spot but by 1956 they already started bottling Pepsi and Amoy also got the rights to Green Spot in Singapore and Malaysia. Thousands upon thousands of Hong Kong children and adults must have drunk the orangeade. Can you add to what Lawrence, Linda and York tells us…? Q + A 28 Village Vehicles (VVs) – made where? IDJ offers some clues in the article below. 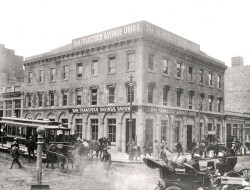 Q+A 29 The Parrott Building, built in HK, re-constructed in San Francisco? Q+A 30 Mystery industrial building on Tsing Yi – paint factory? Our article, Hong Kong Paint manufacturing companies – from early 1930s, includes a possible paint factory on Tsing Yi island. Billy Clarke wrote to the Indhhk Group in May 2015 asking if we had any information about this location and what was manufactured there. 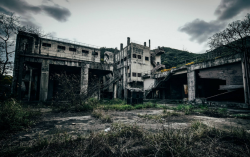 He linked a HK Urbex series of photos and a video, (taken, I think, in June 2014), of a number of buildings at the site which he had found on the hongwrong.com website. The short answer to Billy’s question is no. Billy added in October 2015 that he had still not found anything else out about what is proving to be something of an industrial mystery. He proposes making a video at the location in the near future. 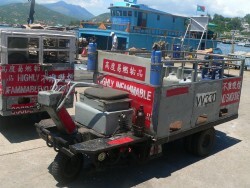 As you will see from the HK Urbex link this was a sizeable operation with a number of buildings. Was this actually a Paint Factory? And if so what was the company? If not…? 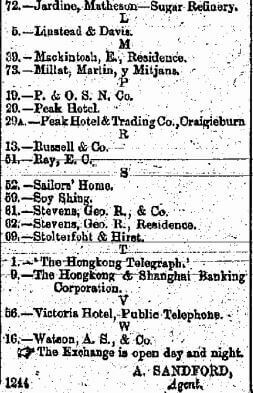 Q+A 31 Telephone Companies in Hong Kong – information wanted pre WW2 HF: An important subject which we have not covered in sufficient detail yet. Post-WW2 would alao be a very useful addition to our Group’s website. This article was first posted on XXXX.